View Poll Results: Favourite statue? Of these major cities, both old and new, small and large, but all world-famous. The 2nd choice would probably be the Turku Pig Duck don't you think? Yep, close 2nd. But you know, the Dear Leader will always be #1. BTW, did you know that the pigduck is amphibious? I didn't until today. I always thought a combination of the Kim Jung Il statue with Kindlifresserbrunnen would be a great piece of art. "End of the Trail". For its iconic social significance reflecting the modern world. 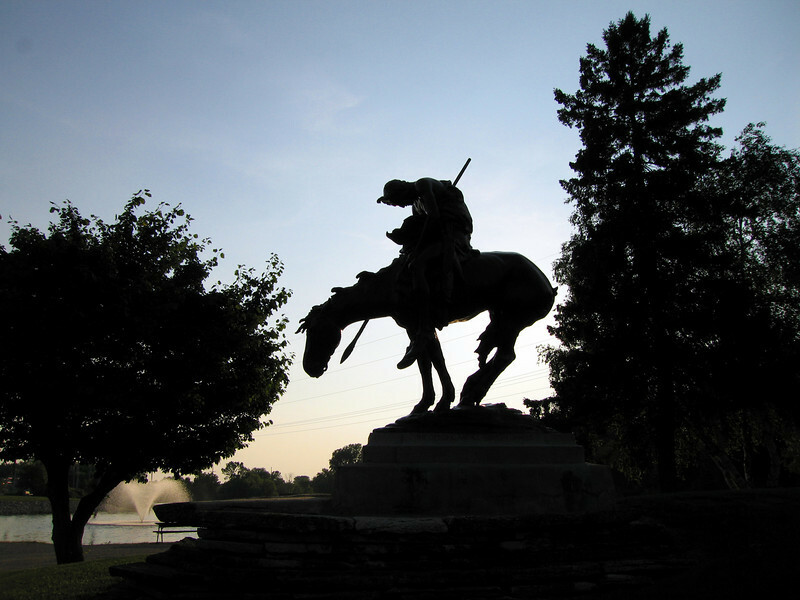 The original work was only about a foot tall, and very few people even recognize the name of the sculptor (James Earle Fraser). This photo is the first public-display-sized casting, and very few people have seen it or even know where it is. It's in a park in a little town in Wisconsin, and if you go by to see it, there will be nobody there, no souvenir stands, no gates of fences around it, you can walk right up and touch it. Yet, is one of the most familiar statues in America and maybe the world, and possibly THE most recognized 20th Century statue. Last edited by jtur88; 06-21-2014 at 09:38 AM..